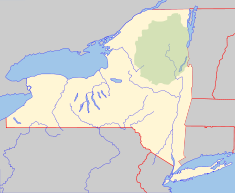 The Battle of Sabbath Day Point took place on 23 July 1757 just off the shore of Sabbath Day Point, Lake George, NY and ended in a French victory. The battle (actually better described as an ambush) pitched approximately 450 French and allied Indian forces under the leadership of Ensign de Corbiere of the Troupes de la Marine against 350 British-allied militia forces under the command of Colonel John Parker. Ensign de Corbiere, aware of Colonel Parker’s plan, ambushed and surrounded Parker’s forces as they approached the shore in bateaux. In the ensuing rout Colonel Parker lost approximately 250 men with nearly 160 men killed or drowned and the rest taken prisoner. The French reported only one man slightly wounded. 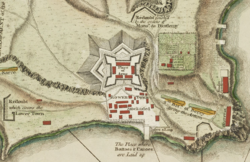 Colonel Monckton, in the only real British success that year, successfully captured Fort Beauséjour in June 1755, cutting the French fortress at Louisbourg off from land-based reinforcements. The victory was tarnished by the decision of Nova Scotia's Governor Charles Lawrence afterwards to order the deportation of the French-speaking Acadian population from the area. Monckton's forces, including companies of Rogers' Rangers, forcibly removed thousands of Acadians, chasing down many who resisted, and sometimes committing atrocities. The Acadian resistance, in concert with native allies, including the Mi'kmaq, was sometimes quite stiff, with ongoing frontier raids. The only clash of any size was the 1757 Battle of Bloody Creek near Annapolis Royal.